I have been asked on numerous occasions why the south end of the old ground, when it was a terraced area, was referred to as the West Bank? The honest answer is “I have no idea, just stories”. My Father always told me that after the War the areas behind the goals were simply the top and bottom goals. Certainly when I started attending regularly in 1968 the West Bank was infamous and was “the” place to stand especially when Barnet kicked down the significantly more pronounced slope in a second half! I believe that when a ground plan started to appear in the programme in the early 1990's as the club required the need for segregation of fans only then were all four terrace areas given their compass point tags. The Popular Side became the East Terrace, the Top Goal became the North Terrace, the Moon or the Morgue Terrace became the North West and the West Bank the South Terrace. The West Bank terracing, as all round the ground, was originally constructed of steps cut into compressed cinder and earth banking with wooden sleepers. It was finished off with a narrow rickety old ornate wooden roof which ran from the corner flag to the goal mouth. The terrace was then concreted and a new central steel and corrugated iron clad roof section was added in the early 1960's when the Popular side also received an upgrade (new roof additions either side of the taller centre section which Held the TV cameras). The terracing started from the where the new toilet block was adjacent to the East Terrace and ran to in line with the penalty area where it dipped away made way for the old tea hut and the social club. The pitched roof, which always seemed to cry out for an advertising hoarding or a clock to conceal its exposed beams straddled the goal mouth between the 6 yard lines. The front roof overhang was removed in the mid 1980's for safety reasons which reduced its impact and of course its sheltering capacity slightly but it was as precious to us as the North Bank at Highbury, the Shed at Chelsea or the Shelf at Tottenham. The Town End at Enfield? Never heard of it! After a Player of the Year awards a few of us missed the last bus back to Finchley and actually slept between the barriers overnight - we felt as safe and warm as if covered by a freshly washed duvet! After the Valley Parade Bradford fire and the Heysel Stadium disaster in 1985 all grounds came under closer scrutiny for safety of spectators via the Popperwell Report. Virtually all terraces in the country were given reduced capacities unless extra safety measures were implemented i.e. extra exits, gangways and crush barriers. As attendances in the 1980’s were significantly lower than in previous decades, clubs often found it less expensive and more beneficial to introduce seating onto existing terraces thus being able to charge higher admissions prices and also to conform to the safety regulations more easily. During the 1990’s this progressed into brand new stands replacing the terracing. It was then the turn of the non league grounds to be investigated and terraces like the West Bank were targeted. Whenever it rained obviously supporters sought cover under the roof so the overall terrace capacity was reduced by the authorities for safety reasons. 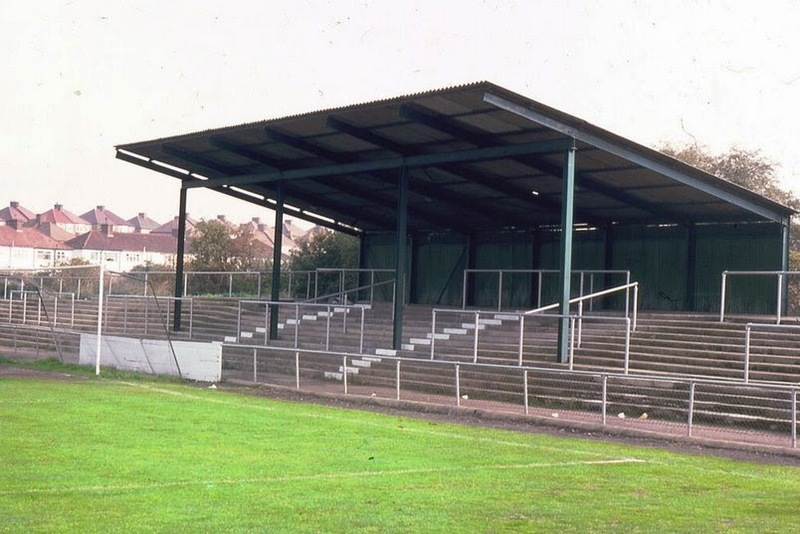 Barnet then removed the roof, as this was significantly cheaper than updating exits and gangways and erecting more crush barriers, therefore increasing the terrace capacity. Next the authorities started insisting on a certain amount of seating in grounds and the West Bank was sadly sacrificed and flattened to make way for an ever increasing and decreasing temporary seating structure. This had two distinct advantages. One, helping the club to reach the required seating to total ground capacity ratio and two provide an easily “policed” area to house the larger number of Football League club away fans that visited Underhill. In 2008 a new amber and black decorated 1,000 seat South Stand structure was erected and proved very popular with supporters. It is designed to be dismantled and easily transportable should the need arise in the future, technology is everywhere! The old West Bank could certainly tell some stories – wild celebrations, persons falling through the roof, terrifying crowd trouble, jovial mass inflatable novelty fights, picnics, bonfires and firework displays - all colourful stuff. Did you know that Bill Meadows when the manager used to sign players while standing on the bank? He has said he tried to obtain a signature before a new player saw the main stand changing facilities! However the West Bank was the spiritual home of the younger more vocal fans at Underhill and befitting a more sinister era with regard to certain breeds of supporter it was imperative in the 1960's, 1970's and 1980's to have an area or end to protect from rival fans and call “yours”. Therefore it needed an identity and perhaps the chap who bestowed the legend was just simply not very good with a compass!